This is a neat Mac trick I accidentally discovered: not only can you launch apps from the toolbar of a Finder window after placing them there, but you can drag folders into any Mac OS X Finder window toolbar as well, and it will stick there allowing for easy access. 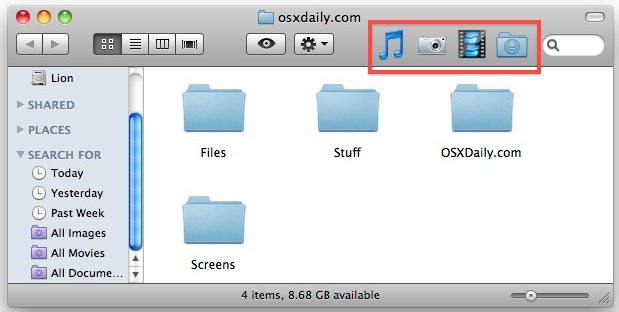 The do this yourself, you just need to drag a folder into the toolbar of any Finder window. Any folder works, but there are some cool unexpected extra styling that comes with some folders that we’ll get to in a moment. The change then carries over to all other active Finder windows, with the folder icon appearing there. And you guessed it, clicking on those picture icons jumps right to that folder, for super quick access to where ever you want to go on the Mac file system. If you don’t want folders in the Finder window toolbar anymore, just drag them off while holding the Command key. CMD+T will put a link of your file or folder to a left sidebar “Places” for quick access as well. I use it a lot for temporary and quickly accessing files and folders; delete it after I am done. This is a great idea, I am going to post a separate tip about it. This is an amazing trick!! Thanks for sharing.